Wow, this is incredible! There are so many angles of this house I thought we'd never get to see, and this one has so many cool details. What a great find! Thanks for sharing, John! Wow, what an extraordinary photograph! So many wonderful details revealed here, but I'm particularly intrigued by the "lattice" pattern at the top of the picture, visible behind the chandelier. I assume that is the vaulted portion of the tin ceiling, but because of the clearly visible pattern, I'm guessing part of it was painted black? I know Houdini painted certain parts of the house interior black, but this seems a very unusual detail - unless it's something entirely different. What do you think? Yes, good catch! I was intrigued by that as well. There is indeed lattice of some sort across the room. It appears very similar to the wood lattice in the entryway. I think this is what Dixie Dooley had drawn in his sketches of 278, and it led me to misunderstand and think this side of the room was sectioned off with a wall. But not the case clearly. It's just section by the lattice. I suspect this was not part of the tin ceiling itself, but maybe just a wooden decorative addition that was taken away instead of being restored like the lattice in the entry. Thanks, John. Yes, it did remind me of that wood lattice in the entry but it seemed a strange place for it at the top of the room. But you must be right, and looking closer at the tin ceiling, the pattern is very different from the lattice pattern. Thanks! Afraid I didn't discuss 278 with DC. We did talk a bit about the Laurel Canyon house and truth behind it. Strange that there are fireplaces on all the other floors of the house, but not in the parlor. Unless there was one there originally and it was later removed. There is a fireplace back in the library area. But, yeah, the upper floors have two fireplaces and this floor only has one. I don't think one had been removed. Thanks, John. 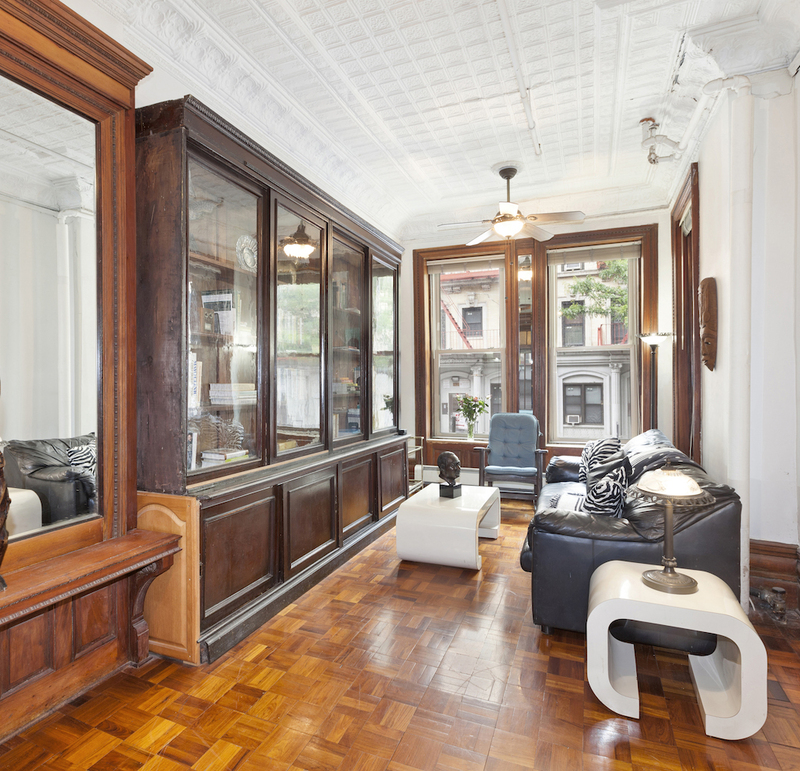 Strangely enough, I live in a brownstone of the same period as 278, on what was originally the parlor floor, and mine is the only apartment in the building without a fireplace, though there is a covered area where one originally stood. I've always wondered why it was taken out. That's why I thought perhaps the same thing might have happened in 278. But apparently that wasn't the case. 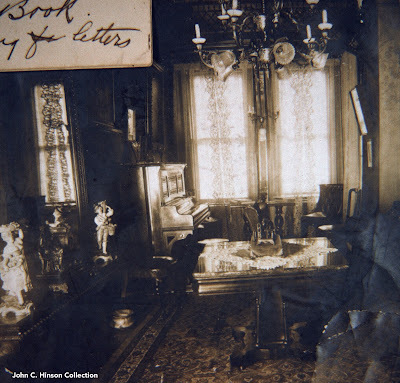 I don't know for sure, but I'm guessing the front parlor was always fireplace-less, especially as we see the gigantic mirror that stands in the only spot where a fireplace would really fit was there in Houdini's day. Yes, you are probably right. Maybe the heat from the fireplace directly below was enough to add warmth to the parlor too. And re. the lattice over near the windows, I was looking at a book with pictures of old Manhattan brownstones around 1900, and saw a wooden lattice pretty much identical (from what I can see) to that in the pic of the old Houdini parlor. In the other pic, it was in the middle of the room and there was a curtain directly below used as a room divider. It made me wonder if Houdini ever hung a curtain from the lattice so he could make an entrance from behind it when guests visited!